Our lives changed significantly in September 2016 when we welcomed our precious baby Anderson "Andy" James to the world. Before his arrival, we had never heard of Marfan syndrome. We had expected a perfectly healthy baby, as all signs had pointed in that direction during the pregnancy. Sometimes life throws you curve balls, however, and in an instant we became both new parents and parents of a baby with special needs. Soon after Andy was born we found out that he has neonatal Marfan syndrome, a connective tissue disorder that affects multiple systems of the body. Neonatal Marfan syndrome is different than classic Marfan syndrome in that many of the typical Marfan syndrome features present themselves earlier and in more severe form than in classic Marfan syndrome. As a result, our little family has been through a lot in the past year and a half. We've been to literally hundreds of doctors and therapy appointments, we've spent several weeks in the hospital, and we've introduced various types of medical equipment into our home. It definitely hasn't been the new parenting experience we imagined, but Andy is our little boy, and he is absolutely perfect in our eyes. He is already such an inspiration to so many people. Seeing him progress through his journey with neonatal Marfan syndrome has brought us so much joy and we are so proud of our little fighter. Learning that your child has a disorder that you've never heard of is very scary. We've found that connecting with others in the Marfan syndrome and related disorders community has been incredibly helpful in so many ways - from learning how to cope with the emotional impact a diagnosis like this can have on one's family to getting answers to various medical questions that come up. The Marfan Foundation has been profoundly instrumental in helping us navigate this new world. They’ve helped connect us with the best doctors in our area that are experienced with Marfan syndrome. The Foundation has also connected us with other families who have children that are severely affected by Marfan syndrome like Andy. 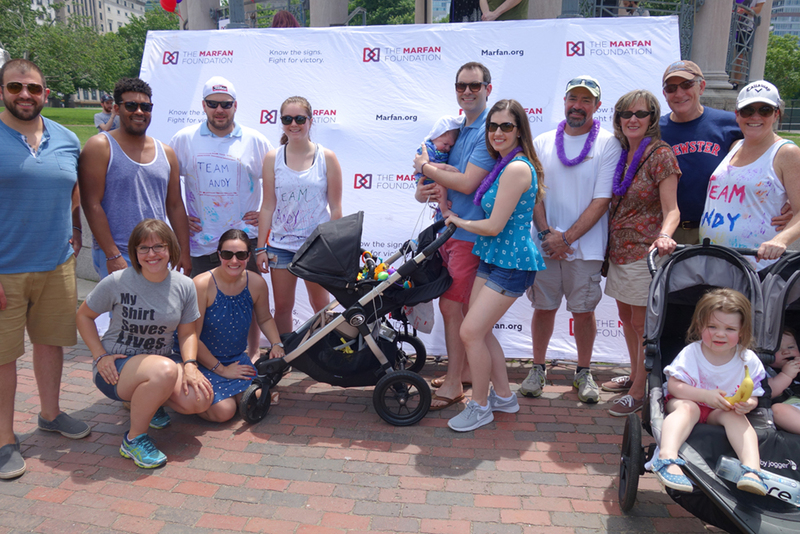 The Walk for Victory in Boston is one of the incredible opportunities The Marfan Foundation facilitates where we are able to network with other families in the Marfan and related disorders community and help raise funds and awareness for the Foundation. We are thrilled to be able to once again participate in the upcoming Walk for Victory this spring. We are so grateful to The Marfan Foundation for the support they've shown to our family and for all of the incredible efforts they are undertaking to help those affected by Marfan and related disorders. We are resolved to achieve victory over these conditions. The Marfan Foundation is doing everything possible, including research, advocacy, and education, to make sure people can live longer, fuller lives. Together we can create a brighter future for everyone living with Marfan syndrome and related disorders. As a donor, you can support The Marfan Foundation by donating to them through your employer’s workplace giving program (CFC# 11152 if you're a military or federal employee participating in the Combined Federal Campaign). Payroll pledges made through employer-sponsored charitable giving programs represent a cost effective and near effortless way to support your favorite charities. As The Marfan Foundation’s workplace giving partner, America’s Charities can help your company design and implement a program centered on supporting their work - through workplace giving campaigns, employee fundraising, cause-focused signature programs, volunteerism, donation drives, matching gifts, Dollars-for-Doers, In-Kind Giving and other employee engagement and philanthropic initiatives. Click here to request a demo and learn how we can help you do this.